Night in and night out for the last decade, many of you have listened to my broadcasts on 1350 KTIK-AM and the video stream on MILB.com – as I called the exploits of the Felix Hernandez’s and the Richie Valdez’s; the Pablo Sandoval’s and the Davy Gregg’s; the Jurickson Profar’s and the K.K. Green’s; the Ryan Flaherty’s, Andrew Cashner’s, and the Dan Vogelbach’s. If you are a die-hard fan, you’ll listen through the Coors Light Extra Innings report each night to hear the highlights from the game, scores from around the Major Leagues, and a look to tomorrow. And if you truly are a fan, you’ll hear two things at the end of each night. A lot of you have come to me, either through emails, through Facebook posts, or at the yard and mention – “P.J., Daddy’s Coming Home.” I close every broadcast with that special bond to my now five-year-old who got a new baseball glove today – but I won’t mention it when we are on the road until getaway day – when P.J. will get to see his Dad in the morning. For a moonlighting minor league broadcaster and full-time collegiate PR guy – those 12 words are a lifeline. You have days where you just want to stay in bed; you have days in which work has overloaded you and you just want to give up; you have days when it is 105 degrees and no air-conditioning – but those who are around me each night have heard me say… You just have to bring it! And that truly is making it a great day. But, where did I get the saying from? Another thing that most do not know is that long before I became the Voice of the Hawks (and Coyotes), I played college football at Pacific Lutheran University in Tacoma, Wash. Now, that is a bit of a stretch, because I was a placekicker – you look at me and most think lineman or linebacker, but I was the guy who kicked balls between the posts. The Jay Feely, the Shayne Graham, the Kyle Brotzman of PLU – I wasn’t the best kicker on the team during my four years, but it was four life-changing years of my life. Friends in the City of Trees had the chance to meet my coach, Frosty Westering, in 2005, when he and his wife Donna were inducted into the World Sports Humanitarian Hall of Fame. Frosty (it wasn’t Coach Westering, or even Coach) was a former Marine drill sergeant that used some of the most unorthodox methods of coaching – we had two full contact practices before our first game; we did not put our shoulder pads on until 10 minutes before kickoff; we had popsicle breaks at practice; we held hands coming off the field; and we won football games. 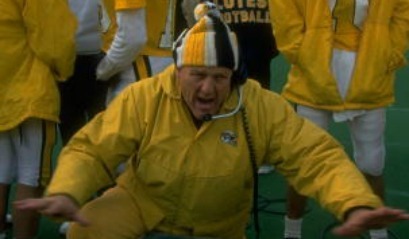 Lots of games – in fact, Frosty won over 300 games in his career, coached in eight national title games, winning championships in 1980, 1987, 1993, and 1999. 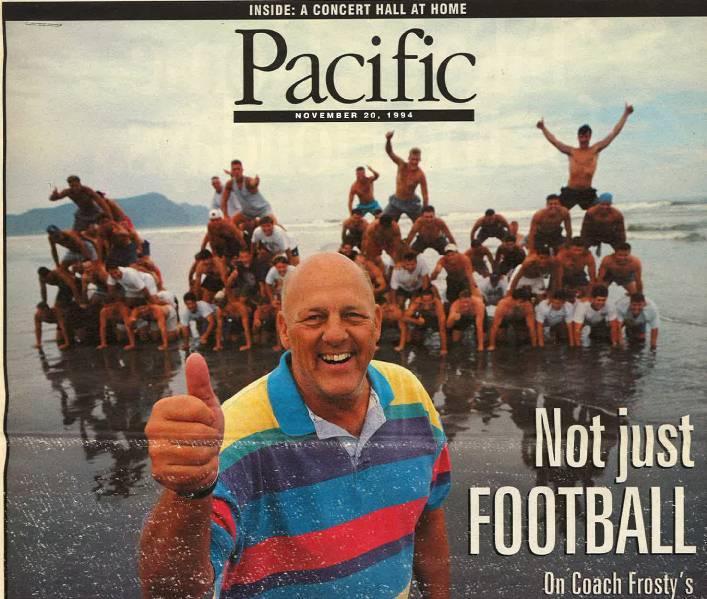 But it wasn’t the wins and losses I remember – and that probably goes for all of the EMAL (an acronym that Frosty came up with – Every Man a Lute, our nickname) players during the four decades he coached at PLU. We remember the trip that we took – that our goal each year wasn’t the end of the road (say the postseason or a title), but our goal WAS THE ROAD, the life lessons, the fellowship, the camaraderie we had. We learned that we can’t always be the best, we can’t always do our best, but each day we can give it our best shot. These are two ideals that were cornerstones of the PLU football program and two ideals I use each day during the season – yes it is great to win ball games, yes it is fun to have a great broadcast, but it isn’t everything. It’s the kidding around the batting cage; it’s playing catch with P.J. during BP; it’s the stories on the bus rides; it’s writing the game stories and blogs at 1 a.m. for the fans; it’s the talks with players and staff during Applebee’s late-night Happy Hour in seemingly every town. Frosty was as humble of a person I’ve ever met – the type that would give the shirt off his back, living his life as Jesus would. A lot of his lessons had a Biblical message – which has a direct effect on 18 to 22 year old males. We learned to be Servant Warriors – giving to others before ourselves, and we learned there truly was MAGIC (Make A Greater Individual Commitment). 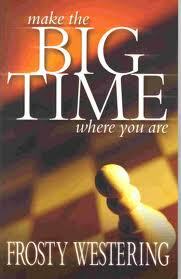 We had a play-book and an “inner-game book” – which focused on shaping us into men. We goal-set each week – focusing on physical things we’d do to make us better (run 10 gassers, do five power cleans), but also on making our teammates better (give six put-ups (affirmations) to players at our position). 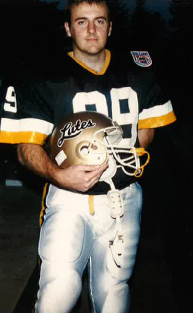 We ran as unorthodox of an offensive scheme in America for the mid-90s – empty backfields before they were commonplace, middle screen passes, double reverse passes, and the hook and ladder – which scored the Lutes at least three touchdowns in my four years. But it all came back to Frosty. I remember sitting in his office as an 18-year-old freshman, finding out I was going to be the starting kicker for the No. 1 team in the nation, going to play on the road at Linfield. During that half-hour talk, I learned how to control my emotions – “Mike, you have to center yourself – visualize your belly-button, it is the center of your body, it will keep you balanced.” But he handed me a plaque that day, which sits in my office at The College of Idaho and said these prophetic words – “Through it all, Mike, regardless of what happens Saturday, you Don’t Just Have a Great Day, Make it a Great Day,” Frosty’s interpretation of Psalm 118. Nearly 20 years later, it still resonnates to this day. When I had to trot on the field in a 13-13 tie in the fourth quarter to kick the go-ahead extra point, Frosty grabbed me and said “Belly Button Mike, Belly Button”. Kick was up, a little left of center, but good. We won the game and ended up playing for a national title that winter. But I don’t remember much of the games (though it is fun to say I played against Dan Hawkins’ Willamette teams and played against Jon Kitna at Central Washington) – I remember singing Rawhide as a team; guys getting excited for practice during Rocktober; practicing in the snow at night when the days got short; and the emotion after we lost that title game – not because we lost, but because we weren’t going to be with the seniors anymore. Frosty, who for years was a highly sought-after motivational speaker, spoke of Making the Big Time Where You Are, which was the name of his first book. Which helps bring me full circle – many ask me why I haven’t tried to move up in broadcasting or why I haven’t tried to move into a Division I sports information job. My “Big Time” is right here in the Treasure Valley, my “Big Time” is making fans feel that Boise Hawks baseball is the major leagues since we have no other baseball close to us; my Big Time is the 300-plus student-athletes at the College of Idaho. 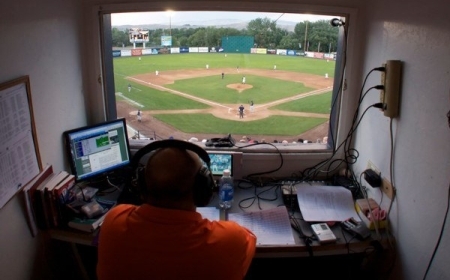 You can see it in my broadcasts – it’s about describing the game, painting a picture, giving you the fan what you deserve – being a Servant Warrior for the Boise baseball fan, instead of anything self gratifying for me. These things really came to heart this past week, as Frosty’s health has begun to falter back home in the Puget Sound area. The tributes this week, the one-liners, the memories – from players in the 70s, 80s, 90s, and 00s, all have common themes – a coach that changed each of our lives and turned us from boys into men. As we inch closer towards June 14 and Opening Day and during the postgame show that night from Eugene – when I utter the words, “You Don’t Just Have a Great Day, Make it a Great Day,” think of Frosty Westering, and the hundreds of lives he changes over the years – as I hope to do as a broadcaster in the future. You start to realize that Spring Training is right around the corner when Baseball America and MLB.com announce their annual prospect rankings, tracking not only the Top-100 minor league players in baseball, but also the Top-10 players for each position in the minors. 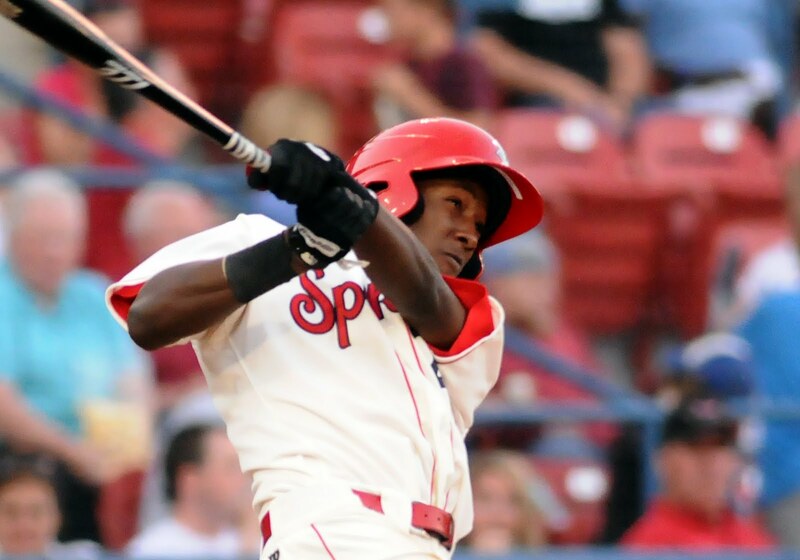 Recently, the Cubs farm system didn’t have the star power that other clubs did – minimal Draft talent at the upper reaches of the prospect list (Brian Dopirak, Ryan Harvey, and Grant Johnson didn’t pan out; Josh Vitters has not established himself as a viable option at third base; while Jeff Samardzija and Andrew Cashner are probably the best picks in the last 10 years – and are middle of the rotation starters at best). The best draft prospects have ended up being Brett Jackson (’09 Hawk) and Josh Donaldson (’07 Hawk) – with Donaldson now the third-baseman for the A’s, while the top Cubs’ prospect of the last decade would probably be Starlin Castro, who was a NDFA. 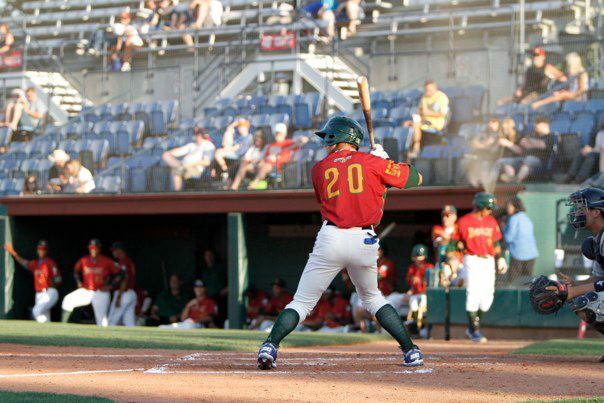 There is much optimism in 2013, as unlike in the past, a trio of Cubs’ youngsters are in not only in the Top-100, but the Top-50, while three former Boise Hawks are in the Top-100. 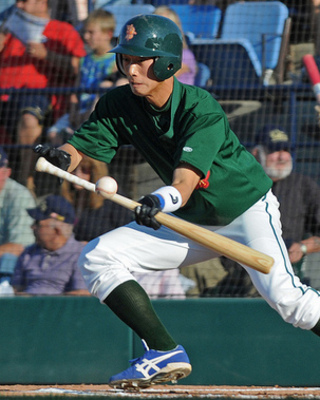 2011 alum, Javier Baez (pictured right), tops the list of Cubs’ prospects at No. 16 – coming off a season where he hit 16 homers and drove in 46 runs in just 80 games. Baez had a quick drink of coffee in Boise during his rookie season and was with the squad during the 2011 postseason run. A 2012 Hawk is also on the list, as outfielder Albert Almora (pictured left0, the Cubs top-pick from the most recent draft, is No. 39. 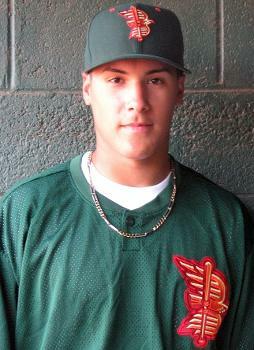 Scouts love Almora’s make-up and Boise fans can attest – he is a true gamer and has that “it” factor. Almora hit .321 with 12 doubles, two homers and 19 RBI in 33 professional games last season. A third Cub on the list is one that bypassed Boise, Jorge Soler, as the Cuban defector is ranked No. 42 after hitting .299 with five homers and 25 RBI last season – and looks to be a possible right-fielder of the future in the Chicago system. Lost in the list is the third former Boise player – Hak-Ju Lee (pictured right), who was a Northwest League All-Star in 2009. Lee (who was remembered as much for his singing in Boise as his stellar play, who was traded to the Tampa Bay Rays as part of the deal that sent the Cubs’ Matt Garza, was the No. 56 rated prospect in baseball. With the AA Montgomery Biscuits, he hit .261 with 10 triples and 37 stolen bases and is one of the top defensive shortstops in the minor leagues. What intrigues me about the list – is how good the Northwest League truly is and how many blue chip prospects come through Memorial Stadium on a yearly basis. Most fans don’t realize the caliber of talent that wear the uniforms of Vancouver, Everett, Spokane and Tri-City; Salem-Keizer, Eugene, now Hillsboro, and the Hawks. A total of nine of the Top-50 players on the list are Northwest League alumni, while a total of 18 former NWL players are in the Top-100. I remember many of them vividly – including the top prospect in all of pro baseball, Jurickson Profar (pictured left) of the Rangers, who made his MLB debut last September. He was a 17-year-old raw talent a couple years back in Spokane, but one could tell that he had the make-up of being a superstar. Spokane has had its share of talent – slugging third-baseman Mike Olt, who was a college teammate of former Hawk, Pierre LePage at UConn, is No. 22, slick fielding catcher Jorge Alfaro (I can still hear Mike Boyle saying Jorrrr-hayyyyy Al-farrrr-o after a big hit against Boise) is No. 88, while tough left-hander Martin Perez is No. 95. Vancouver has been loaded in the pitching department the past few years – helping the club to two-straight NWL titles, and those arms are prevalent on the list – including No. 29 Noah Syndegaard, No. 35 Aaron Sanchez, No. 72 Justin Nicolino, and No. 90 Roberto Osuna – who pitched Game 2 against the Hawks in the 2012 NWL championship series. A pair of Eugene infielders – Jedd Gyorko (No. 50) and Rymer Liriano (No. 55) made the cut, as did former Yakima (now Hillsboro) third-baseman Matt Davidson at No. 77. I do feel for Everett, as the Mariners skipped many of their top pitching talent that rank highly on the chart, but did send No. 23 Mike Zunino to the Aquasox, as the Hawks saw first-hand in the five-game set in the Puget Sound area last summer – as the catcher hit 10 homers in just 29 NWL games. It will be interesting to see who the new cast of characters will be this summer and potentially crack the list in the near future.